Proceed Without Using a Project: This option runs the IDE with no current project. This is also done if you simply cancel the startup dialog by pressing the Escape key or clicking the Cancel button. When there is no current project, warning dialogs may appear if you try to use certain project functionality such as showing the Project Manager dialog, creating a new form, or clicking the Components toolbar. And a few things may behave differently; for example, when saving an editor buffer for the first time, you will not be prompted about whether to add the new file to the current project, since there is no current project. Run the Interactive IDE Introduction This option starts up a high-level introduction to the variety of development tools that are available in the IDE. (No project is created or opened.) The introduction may also be run with the Help | Interactive IDE Intro menu command at any time. This dialog may be disabled for future lisp sessions by unchecking the check-box labeled Show this dialog at IDE startup time near the bottom of the dialog. 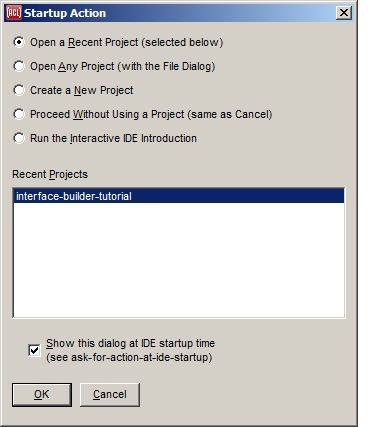 The dialog may also be enabled or disabled on the IDE1 tab of the Options dialog (displayed with Tools | Options) by using the check-box labeled Ask for Action at IDE Startup, or by calling (setf ask-for-action-at-ide-startup). When this dialog is disabled, the IDE never opens or creates a project at startup time, though you can open or create a project any time later.